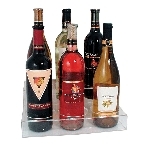 Raise your customers beverage spirits with the right display rack! 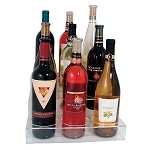 Showcase various wine stands with more than a few featured wines bottles. 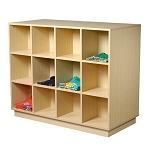 All Store Displays offers you a variety of retail fixtures in many shapes, sizes, and material to best fit your decor needs. From rustic to modern or from permanent positions to portable displays, our styles are more than plenty. Add a touch of individuality with a few of the more unique designs such as the Iron Bicycle Rack that holds three bottles comfortably and an ideal gift for those biking enthusiast. 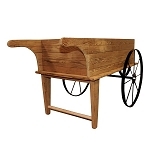 Other unique items such as the wooden 6-pack carrier, the barrel shaped bottle holder and the stack-able crates offer a country appeal with their wood material and design. Looking to give a single bottle of wine? Check out our various sized cylinder shaped boxes and the good ole hinged wine box. Your family or friends can continue to reuse those boxes for other needs. Retailers, the easier customers can view the assortment of wines you have to offer, the higher your profits could potentially be! From smaller stack-able wine cubes to large storage wine racks, there is a free standing wine display to meet your retailing display needs. 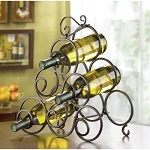 Think of sturdiness and dependability along with versatility that these delicious wine fixtures offer your decor', advertisements or simply cross-merchandising other merchandise together. Be creative with your decorating ideas and gain the attention your products deserve. So browse around and see what you might discover for your business or home. 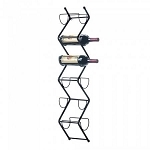 Possibilities are endless for storage of wine and other bottled beverages when you purchase retail wine fixtures. Take a chance in increasing customer base, sales and profits. Order yours today!